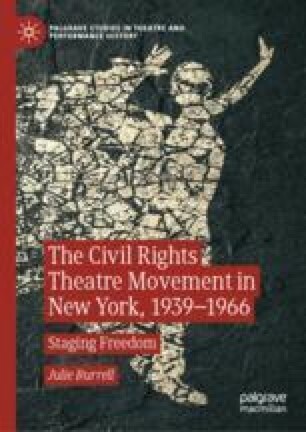 This chapter surveys a diminished but defiant black theatre community in 1950s New York City that launched a concerted attack on anti-Communist repression, from Harlem to Greenwich Village. Burrell takes up a set of Cold War-civil rights plays—William Branch’s A Medal for Willie (1951), Ossie Davis’s Alice in Wonder (1952), and Alice Childress’s Trouble in Mind (1955)—which both engaged in black feminist theorizing and satirized white, liberal playwrights’ attempts at depicting black resistance. Using innovative metatheatrical staging techniques, Branch, Davis, and Childress explored the imbrication of the increasing postwar push for civil rights with the United States’ Cold War policies.